When in Vienna, do as the Parisians do…a task made considerably easier by the Festival du Film Francophone, which brings the best of French-language cinema to the city. Now in its 21st year, the Festival du Film Francophone typically features a heady mix of traditional movies, documentaries, animations and shorts. The word Francophone in the festival title is no coincidence: the films come from a variety of countries, all of whom share French as a common language. So while France inevitably dominates, you might also find something from the Ivory Coast or another African country, Belgium, Luxembourg, Switzerland and Canada. 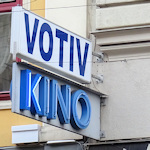 The event runs under the auspices of the Institut Français d’Autriche and takes place in the Votiv Kino, an international cinema that often shows English-language films without dubbing. The festival films are shown in French (of course), with subtitles in either German or English. This year’s festival features 29 films, with the likes of Deneuve, Binoche, Casta, Luchini and Amalric casting their cinematic spell on the screen. Look out for a special showing of Jean-Luc Godard’s 1963 film, Le Mépris (Contempt), which starred Brigitte Bardot with Jack Palance and Michel Piccoli. The director of Vienna’s State Opera House, Dominique Meyer, selected this classic to appear at the festival and he will talk about the film after the April 10 showing. Also look for the evening of shorts on April 6, featuring eight films selected by students at the University of Vienna’s Institut für Romanistik. See the full festival programme at the official website. The Festival du Film Francophone runs from April 1 to April 11, 2019, with films shown daily. Simply buy your tickets for individual showings from the Votiv Kino cinema or reserve them via the festival website. The cinema is handily placed near one of the bigger transport hubs in the centre of Vienna and opposite the Votivkirche church. Tram/bus: Take trams 37, 38, 40, 41 or 42 to Schwarzspanierstraße, which is the stop outside the Votiv Kino. All these trams leave from Schottentor station. Bus 40A stops nearby at Berggasse, close to the Sigmund Freud Museum.